Great Lakes Wholesale Group offers a constantly refreshed selection of over 1,000 wholesale food and snack items. Whether you are looking for snacks and candy to drive impulse counter sales, or discount meals and sides, we have a terrific selection. You don’t need to be a grocery store to have a successful food section. We have a hardware store customer that does a terrific business in spices! 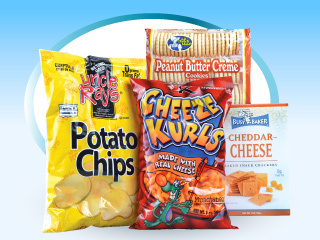 Some of our most popular items include Uncle Ray's Potato Chips, Cheese Kurl brand products, Bud's Best Cookies, Busy Baker Crackers, Hershey and M&M Mars Candy, Loretta Baking Mixes, Spice Supreme Spices and much more! To review our entire Food selection, click on SNACKS below to start browsing.